This category contains Watch Fobs with a Americana Theme. Watch fobs were worn on watch chains. They were popular during Victorian times and after. Many styles, especially advertising designs, are still made today. Vintage Bronze USRA Pistol Match Award Pocket Watch FobVintage Bronze USRA Pistol Match Award Pocket..
Vintage Concord Schoolhouse Birthplace of JR. O.U.A.M. Watch Fob. Vintage Concord Schoolhouse Birthplace of JR. O.U.A.M. 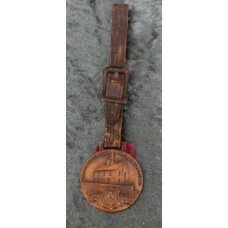 Watch Fob.Very Rare Concord Schoolhouse Birth..